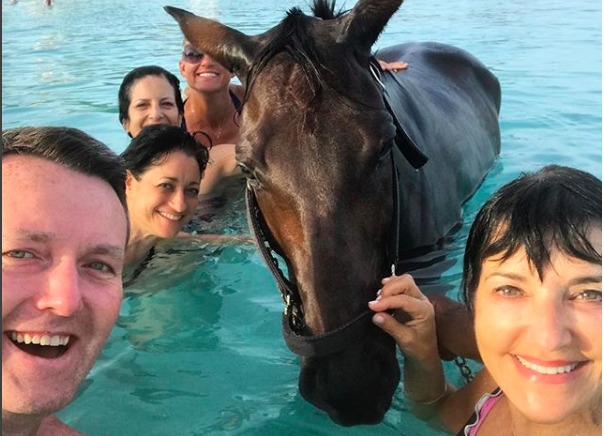 Meryl and friends from the Society of American Travel Writers having a dip in Carlisle Bay, Barbados, with a horse. 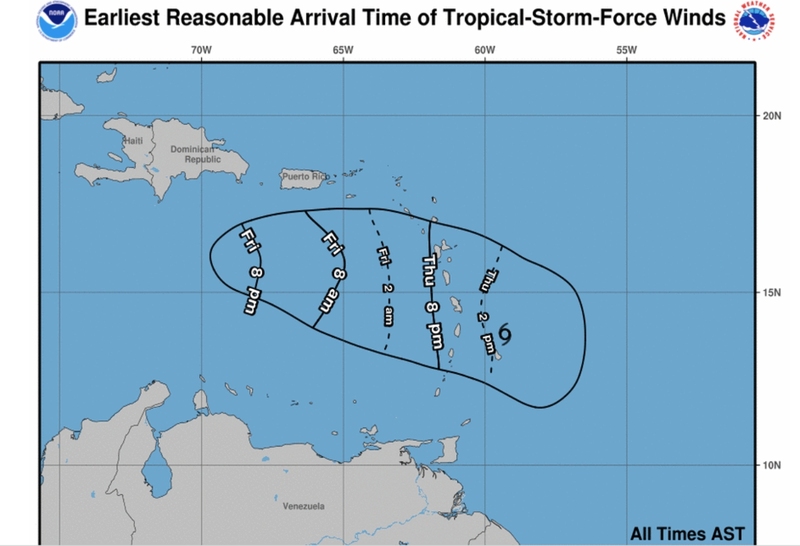 Visitors to Barbados did not let torrential rains, gusty winds, weather advisories and outages due to Tropical Storm Kirk upset their holidays. 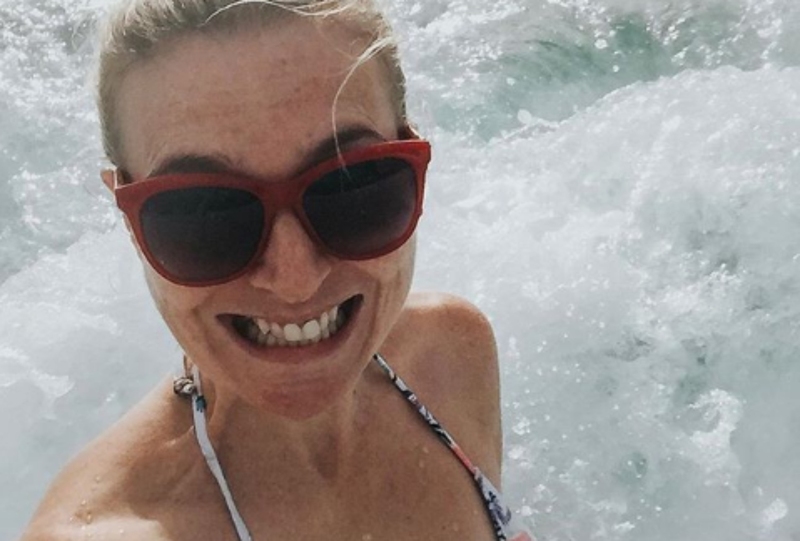 Meg Phillips, an Actress and Private Pilot, took to her Instagram account and tagged her #TropicalStormKirk aftermath photo gallery with a quirky caption, "The aftermath of Kirk. Rum & ramen it is. 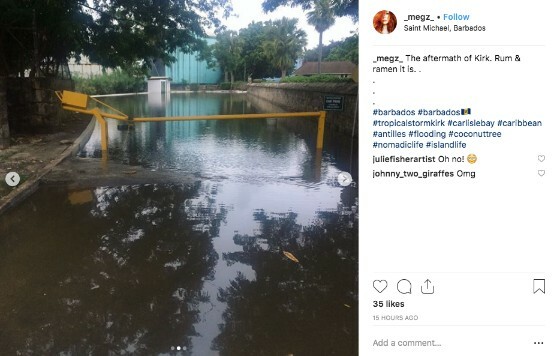 #carlislebay #caribbean#antilles #flooding #coconuttree#nomadiclife #islandlife"
Staying at Hilton Barbados, she showed the road was flooded, along with the parking areas after Kirk's downpour and thunderstorms. 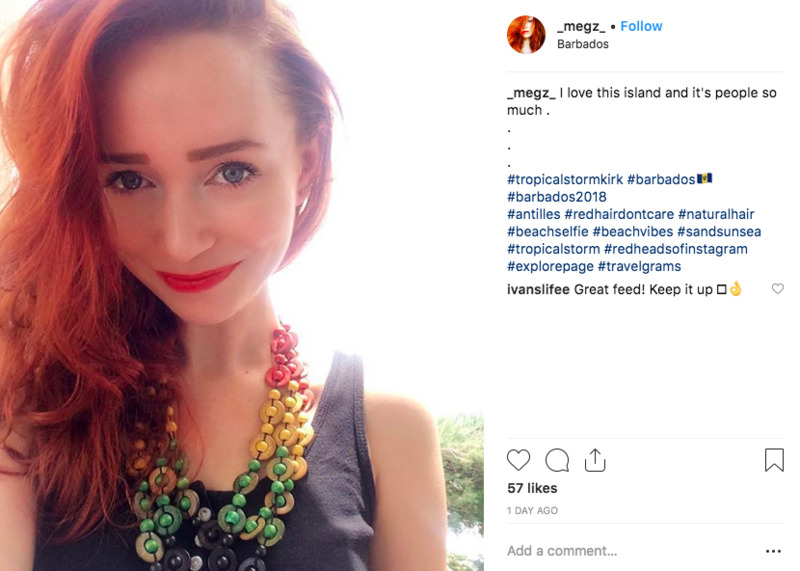 Regardless, she loves this island. www.webcamtraveler.com and www.berkeleyandbeyond.com got a glimpse of what it looked like to the North of the island where she was staying. But she didn't stay indoors. Oh no! 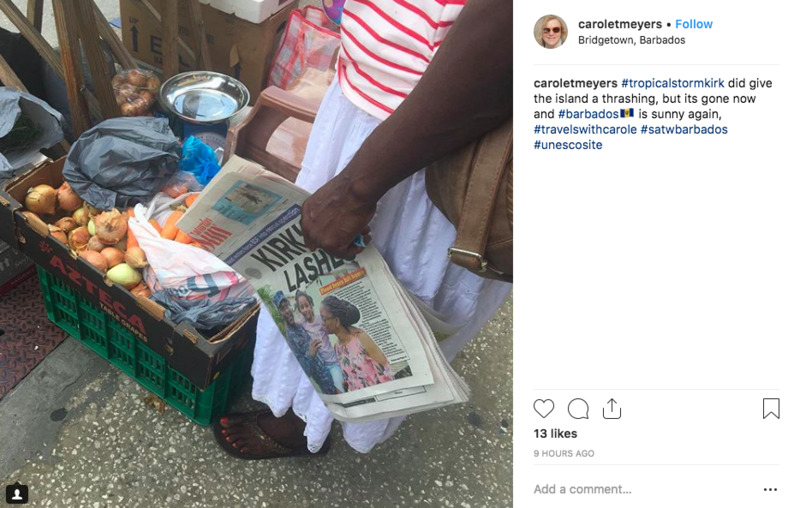 Despite the Tropical Storm, Carole visited the Jewish Synagogue, had dinner with 'George Washington' at his 'House', saw Rihanna's house on Rihanna Drive, tasted Mount Gay Rum, toured Bridgetown and even saw acrobatic shaggy bears. 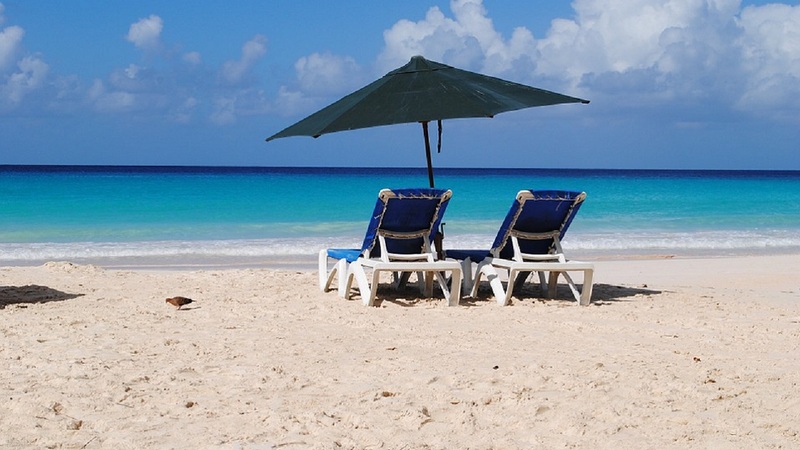 In Barbados just in time to experience Kirk also, was a travel-obsessed foodie and food-obsessed world traveler, writer and publicist, Meryl Pearlstein. Staying at Hilton Barbados too she showed a video of rain pouring over the pool area at her hotel and she videoed cars driving through the flooded roadway to enter and exit the Hilton. 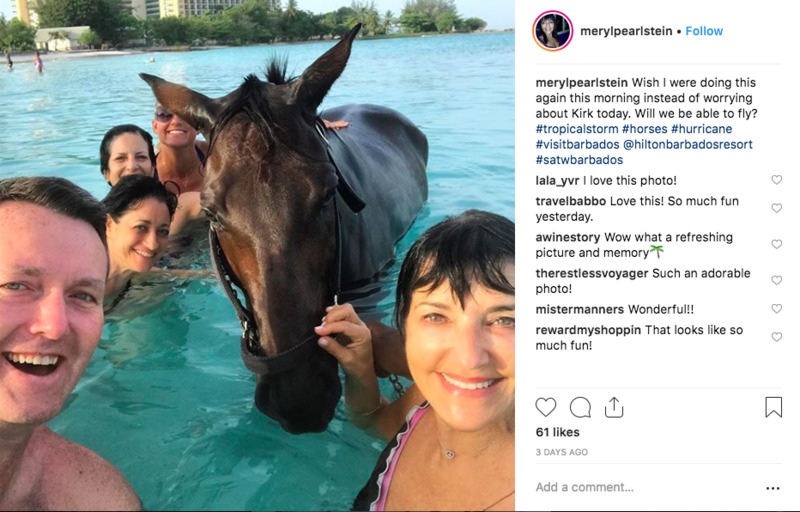 Though she worried about Kirk's arrival on Friday after swimming with a horse in Carlisle Bay in Barbados the Thursday, she was a bit sad to give up her residency at Hilton Barbados when she finally got off the island and arrived in Grenada on Saturday.